If your training and competition needs require that you transport 3 dogs safely and securely, the Hunter Standard Dog Box (3 dog) is the aluminum dog box you need. With triple dog compartments and a top storage compartment that runs the full width of the dog box, there's plenty of room for dogs and equipment. 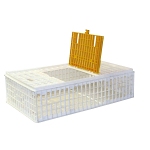 Each dog compartment is separated with a center divider panel that allows for ventilation among the compartments. The large model comes standard with an extra vent on the back. The extra back vent is available as an option on the small model. The doors are lockable and feature removable storm covers for the door vents. 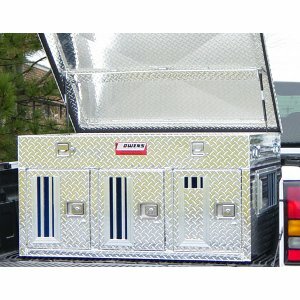 You won't hear any rattling on this rugged aluminum dog box.